Alabama State Bar president Anthony Joseph returned to his alma mater, Samford University's Cumberland School of Law, to address its new law students at the start of the fall semester Aug. 12. "I sat where you are sitting and there was a world of emotions going through my mind," he said. 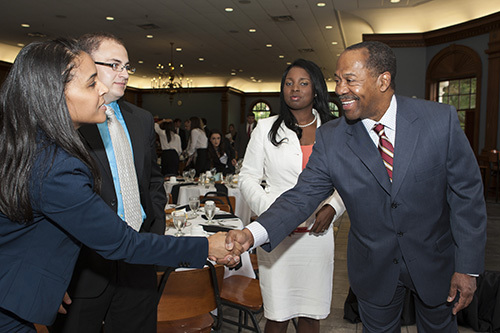 Joseph (right), a 1980 law school graduate, told the students that law school would teach them to work as a team. "The legal profession is built on service; service to clients and service to the community," he added. "This should be the attitude that motivates you as you move forward in your legal career. "You are starting a journey today, a very important journey. Most of you have been exposed to people who have inspired you, encouraged you, or motivated you in some form or fashion." Law school would provide many opportunities to engage such people, he said. Joseph became the 2013-14 Alabama State Bar president in July. He is the third consecutive Cumberland School of Law graduate to hold this leadership position. As the fall keynote speaker for the law school, he addressed an audience of first-year law students, law faculty, law staff and Samford administrators. "I personally cannot think of a better profession for you to pursue," he said. "I cannot think of a greater law school for you to attend than Cumberland School of Law." Derrek Smith is Director of Law School Communications for Samford University's Cumberland School of Law.